Andrew George Latta McNaughton, born in Moosomin (then North-West Territories, now in Saskatchewan) February 25, 1887, died in Montebello (Quebec) July 11, 1966. 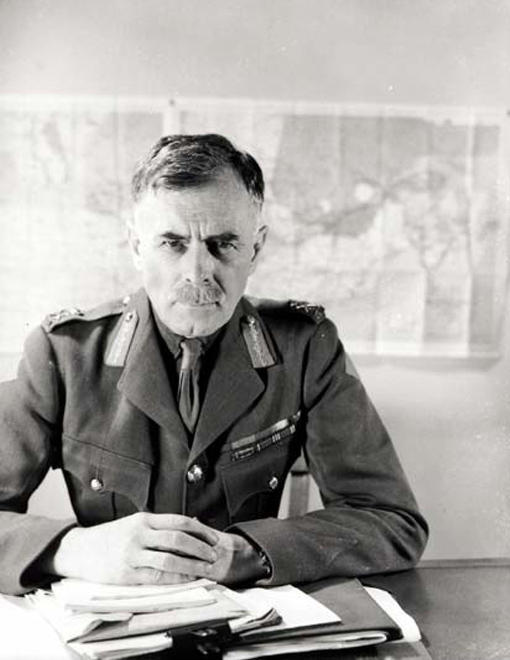 General Officer Commanding First Canadian Infantry Division from 1939 to 1940, First Canadian Corps from 1940 to 1942, General Officer Commanding-in-Chief First Canadian Army from 1942 to 1943, Minister of Defence from 1944 to 1945. Department of National Defence / National Archives of Canada, PA-132648. Andrew McNaughton graduated in physics and engineering from McGill University in Montreal (B.S., 1910, M.S., 1912). He enlists in the Militia in 1909, then in 1914, in the 4th Battery of the Canadian Expeditionary Corps. Applying his scientific knowledge to artillery, he is rapidly promoted and when the war ends, he is at the head of the Canadian Artillery Corps. After the Great War, he remains with the Canadian Permanent Forces as Chief of the General Staff. He works at mechanizing the armed forces and modernizing the Militia. He returns for a few years to civilian life and from 1935 to 1939 is head of the National Research Council of Canada. When war breaks out, McNaughton becomes commanding officer of the First Canadian Infantry Division. Under his leadership, the Division grows and is reorganized as a corps (1940), and then as an army (1942). McNaughton’s contribution to the development of new techniques is outstanding, especially in the field of detection and weaponry, including the discarding sabot projectile. He is however criticized for his poor judgment regarding military strategy especially his approval of the ill-fated operation against Dieppe. His obstinate opposition to the fragmentation of Canadian troops stationed in Great Britain antagonized both the British senior Staff and the Canadian government. Pressured by critics and weakened by health problems, McNaughton resigned his command in December 1943. Prime Minister King’s trust towards McNaughton remains unabated and he is appointed Minister of Defence in 1944, with the specific mandate to solve the conscription issue. He will prove unable to find a solution, and Canadians deny him the support he needs to be elected to the House of Commons. After WWII, Andrew McNaughton is Canada’s Representative to the United Nations’ Atomic Energy Commission; he chairs the Canadian Atomic Energy Control Commission from 1946 to 1948. He acts as Permanent Representative to the UN from 1948 to 1949, then between 1950 and 1959, he is the President of the Canadian section of the International Joint Commission.